Unit1How can we become good learners? 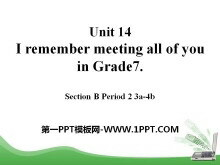 Unit2I think that mooncakes are delicious! Unit3Could you please tell me where the restrooms are? Unit5What are the shirts made of? 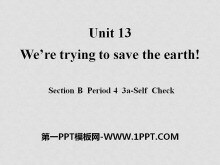 Unit13We're trying to save the earth! 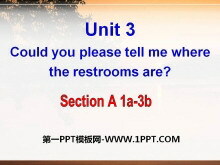 《Could you please tell me where the restrooms are?》PPT课件19 1 Fill in the blanks with the words in the box. corner direct polite rush suggest plan 1. A: Could you tell me where the library is? B: Its on the ..
《Could you please tell me where the restrooms are?》PPT课件18 Free Talk Look at the following pictures. What qualities are important for each place? Match the adjectives with their opposites. (Ⅰ) (Ⅱ) 1. crow..
《Could you please tell me where the restrooms are?》PPT课件17 Review Make a dialogue asking and giving direction. A: Excuse me could you please tell me how to get to / where is ? B: Sure just What do you often..
《Could you please tell me where the restrooms are?》PPT课件16 objectives 1. Learn how to ask for information politely 2. Follow directions Where can we ? 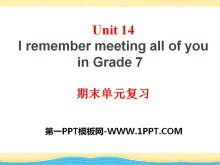 take out get some money save money 问路的常用句型 Ex..
《I remember meeting all of you in Grade 7》PPT课件14 ◆单词过关 一、词义助记。 1．标准；水平 standard 2.一排；一行 row 3．加倍；两倍的 double 4.将要；将会 shall 5．课本；文本 text 6.水平 level 7．学位；度数 de..
《I remember meeting all of you in Grade 7》PPT课件13 Revision Translate the phrases. 对某人心存感激 be thankful to sb 连同 along with 对......有责任 be responsible for 渴求，渴望 be thirsty for （时间）过去 go..
《I remember meeting all of you in Grade 7》PPT课件12 Free talk Talk about what you hope to do in the future with your parnter. A: What do you hope to do in the future? 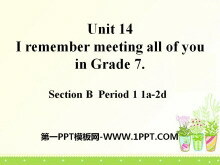 B: I hope to get a business degree and be..
《I remember meeting all of you in Grade 7》PPT课件11 3a Read the passage and answer the questions. 1. What kind of writing is this? Poem. 2. What is the main subject of this writing? 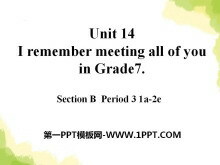 The memory of the junior h..
《I remember meeting all of you in Grade 7》PPT课件10 熟悉下面新单词 1. With the help of Mr. Wang. 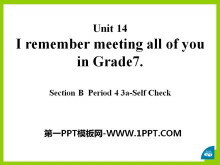 My English standard has improved a lot. 2. The reporter is doing a survey 3. The students stand in a row 4. 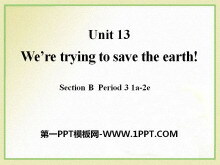 The..
《We're trying to save the earth!》PPT课件12 ◆单词过关 一、词义助记。 1．煤；煤块 coal 2.外卖食物 takeaway 3．垃圾箱 bin 4.鲨鱼 shark 5．(鱼)鳍 fin 6．链子；链条chain 7．生态系统 ecosystem 8．工业；行业 indust..
《We're trying to save the earth!》PPT课件11 Revision 1. 停止乘小汽车 stop riding in cars 2. 回收纸 recycle paper 3. 用纸巾 use paper napkins 4. 好好利用 put to good use 5. 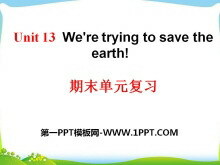 用垃圾建造房子 build a house out of r..
《We're trying to save the earth!》PPT课件10 Warming up How can we do to help save the earth? Dont use paper napkins. You can help reduce pollution by putting that soda can in a different bin. Leave your car at..